Claremorris Chamber is pressing the Government and National Roads Authority to use the same funding formula that got the N7-N11 Arklow-Newlands Cross motorway started, to be used for funding the N17-N18 Tuam-Gort motorway. 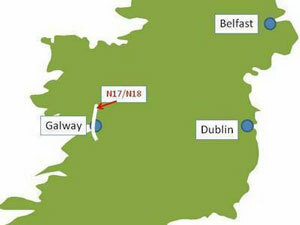 A €100m PPP involving the Government, European Investment Bank and Bank of Ireland means the new N7-N11 Arklow-Newlands Cross road will be open by 2014. If the NRA can work up a similar PPP for the N17-N18 Tuam-Gort, there’s a good chance it could be finished by 2017. The Chamber can then push hard for the much shorter new stretch from Claremorris to Milltown to be prioritised. The NRA, though strapped for cash itself, wants to get the N17-N18 Tuam-Gort built sooner rather than later. It says the construction will be cash-positive for the Exchequer from 2013-2016 and it intends to put that case to Transport Minister Leo Varadkar once it proves that project funding is available. The indications are that the preparatory work on the private financing will be done towards the end of this year. The new, 57-km N17-N18 Tuam-Gort road, which will meet the Tuam bypass south of Milltown, is part of the ‘Atlantic Corridor’ between Letterkenny and Waterford. For connectivity, it’s as important as our high-speed, fibre-optic Metro MAN in making Claremorris a hotspot for investment. The N17-N18 Tuam-Gort, which is to be done via PPP, stalled when the recession began and private funding dried up. But important steps have already been taken and more are planned, which we hope will get the project started before long. The statutory approval is in place and a preferred bidder picked to build and manage the road. Outstanding is the funding. That’s what we’re chasing.